Before we start, please note that most Apple devices don’t support the virtual serial link profile that these modules use. A really easy method of making your projects wireless is to use serial Bluetooth modules, these modules take standard serial data and transparently transmit it via Bluetooth to another connected Bluetooth module, no extra code is needed. Adding Bluetooth to your project so it can be controlled by your phone is easy, just plugging in a slave module and connecting to it from your phone is all it takes, but getting 2 modules to communicate with each other is a bit trickier. Bluetooth works by having a slave and a master. The slave modules can not initiate a connection to another Bluetooth device, but can accept connections, the master can be be set to either master or slave mode, when in master mode the module can initiate a connection to other devices. Be sure not to make the mistake of buying 2 slaves like I did! 2 masters or 1 master and 1 slave is what you need. The master modules (~£8) are usually a little bit more expensive than the slave modules (~£6). The modules contain 2 parts, the back plane and the main Bluetooth board. The main Bluetooth part of the module is designed for 3.3V, the back plane board has a 3.3V regulator built in so supplying 5V for power is fine, but there is no level conversion for the serial data, you probably don’t need to level convert the output (TXD) data since most 5V controllers see 3.3V as high, but the serial input (RXD) does need conversion, a voltage divider or resistor and zener diode will do the job. To configure the modules you will need a USB to serial converter, search for CP2102 on eBay or DealExtreme and you should be able to find them for less than £2, I’d recommend you get 2 so you can have both slave and master connected to your computer at the same time, make sure at least one of the converters has a 3.3V out as well as 5V out. The serial converters usually use 3.3V signaling for serial, so no level conversion needed. You will need a serial console program, I use RealTerm. 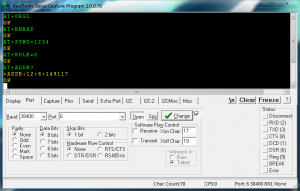 The slave module can be configured whenever no other BT devices are connected to it, the default baud rate is 9600, no parity, 8 data bits, 1 stop bit. Once you’ve opened the COM port in your serial console, type AT, the module should reply back with OK. The timing of sending characters is important, if you type too slow the module won’t recognise the command, it will see it as 2 separate commands A and T, its probably best to copy & paste. To check the firmware copy & paste AT+VERSION and it should respond with OKLinvor1.5. The baud rate will always be 38400 with this method, the module must also be power cycled to get back into normal mode. The baud rate will be whatever it’s configured to, default 9600, the module can be put in and out of AT mode without being power cycled. The timing of commands doesn’t matter with the master modules, instead you need to end each command by pressing the enter key (\r\n), sometimes the response will be continually repeated, pressing enter again will stop it. Now that you have the address you can skip the AT+INQ and AT+RNAME? parts for configuring the master. Turn off the module, disconnect key from 3.3V and turn back on. Note: If it says Error:(17) then that means it’s already loaded, you can carry on. Type can be ignored. The signal will be 7FFF since inquire is in standard mode, in RSSI mode you’ll get a load of the same device but with different signal levels which you don’t want at the moment. Response should be +RNAME:linvor if you’re using a normal slave module or +RNAME:HC05 if you’re using a master module as a slave. Note: If you are going to make the master connect to your phone then you need to set the timeout long enough for you to type in the PIN. If successful the slave LED should be on solid and the master LED should have a heartbeat flash pattern. The modules have now been configured! They should automatically connect to each other whenever possible. A full list of commands for master modules can be found in the download below. Now, if you entered AT mode on the master module by connecting key to 3.3V before turning on the module, you will need to turn off the module, disconnect key and turn it back on. If you connected key while the module was on then all you need to do is disconnect key. If you open up 2 serial consoles and have one open the COM port to the slave and the other open the COM port to the master you should be able to type in one and it will appear in the other console, if that worked you just need to plug them in to your projects! The Bluetooth board of these modules also have connections for SPI, USB and PCM audio, no idea if they work or not. Can you send me a hi-res image of the components on the backplane of your bluetooth modules? Or can you get the numbers off the regulator so I can make a backplane? 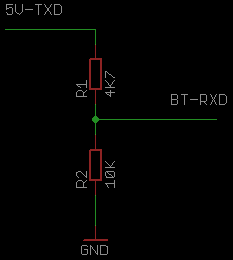 The bluetooth modules I ordered did not come with a voltage regulating backplane and I plan to work in the voltage conversion circuit you diagrammed above so its all compact. I couldn’t get a decent photo, but the number of the regulator is 662K. The backplane just contains a 3.3V regulator, some capacitors for the regulator, an LED, a resistor for the LED (2.2K), a resistor for pulling down the key pin (10K) and a diode to to protect against wiring power backwards. Any 3.3V regulator that can supply 50mA will work. Do I have to set some setting on the module before use first time with microcontroller? No, once configured they should just work with the microcontroller. Does it just reply with OK and no list of devices after a few seconds? And what kind of device is it meant to be looking for (phone, another BT module etc)? I had exactly the same issue. Module is HC-05 with backplane that has a push button to put it into AT command mode (bought from Banggood). Most commands worked okay when powering up the module with the button pressed. Commands like AT+NAME? or AT+INQ are only working for me, when putting the thing into command mode AFTER applying power. For the moment this leaves me with manually pressing the button as it is not connect to one of the pins. This can be quite challenging (missing a third hand) when you want to enter a couple of commands. I just found that using a crocodile clip can be used to press the button as a workaround. why i enter command at+init , it does not reply? What i try to do is to connect my HC-05 device with my Wii-Mote. Sadly noone ever did that before with “real hardware”, only with usb doogles and windows/linux software. But what i want to do is to connect with my HC-05 (or whatever else i should buy) with my Wiimote. The HC-05 is connected with my Arduino so i can controll the communication very easy. The problem is that i cannot pair the two devices. I read that you dont need that for the Wii-Remote and linking should be fine. But i cant get a connection, it always says FAIL. Getting the Address and the name just works fine. It also responds to the inq. Maybe you can help me or know any website where i can get information/help to get this working? It also sais that SPP is NOT supported. Does this mean that i can give this up? I got the HC-05 connected to the PC as slave (just connected after received the package and powered the module). Pairing as master might work, i am not sure. Windows sais error but my toshiba bluetooth stack wants the pin from me and the hc-05 saves the connection. At least my old sony ericsson k610i is connected properly but i do not know how the protocol works, will check this out now. (dont wanna destroy something). One thing i want to mention: I was confused: in your tutrial you switched the cmode possibly? the datasheet sais 0 and 1 the other way around. Not sure what is correct. CMODE 0 and 1 are the wrong way around, fixed. Though it can probably be left at its default 0 in this situation. Thanks for the datasheet, I’ll add it to the download. Have you successfully connect your wiimote With the HC05 ? The Wiimote uses the Bluetooth HID profile, so it won’t work with these HC05 modules since they use the serial profile (SPP). thanks for the phantastic tutorial! i was just wondering whether it’s possible to connect multiple slaves to one master? is whether the bt master module can connect at all to a couple of slaves. to the respective one via some AT commands. Yeah it’s possible, but only 1 device at a time. The AT+DISC command will make the master disconnect and then you can run through the AT+PAIR and AT+LINK commands to connect to another BT device. Just set the key pin HIGH when you’re dealing with commands and LOW when dealing with data (once you’ve connected). You can do the AT+INQ and AT+PAIR commands while still connected to another device, but make sure you disconnect before the final AT+LINK otherwise the master will bug out. Hi, I’m a beginner with BT, bought my HC-05 today (mounted on a BT Shield V2.2 for Netdiuno). First I’ve tried to see, if my phone can finde the device and it did. I also could connect. Then I started to discover it and wrote a small programm to handle AT commands. Since I’ve set Baudrate to 9600 first I couldn’t estabish a connection. Then I set the correct Baudrate, sent AT and got an ERROR back. My idea was, I have something misconfigured with the first Trials, the correct reason was some pending AT commands from previous trials. But since the ERROR I decided to send AT+ORGL. I think this was a mistake. The the device name changed, I found another on my phone. Then I changed the Name, AT-NAME? gives me the correct one. But now the HC-05 is no more shown on the phone or laptop. What do I have to do to get it back shown on other devices? AT-STATE? which respondes “INIZIALIZED”, I assume it should be “PAIRABLE”, right? What am I missing. CMODE and CLASS are only for master mode (ROLE=1). STATE returning “INIZIALIZED” is correct because in slave mode (ROLE=0) the module is only pairable/discoverable after setting the KEY pin low (or disconnecting the KEY pin). Hello! I followed this tutorial and everything worked, congrats and thank you! I have a HC-05(Master) and other HC-05(Slave), they are paired and connected, there’s a way to send an AT command thru HC-05(Master) to work with some HC-05(Slave)’s PIO? As far as I know there’s no way of directly sending commands to other connected BT modules. You’ll need a microcontroller connected to the slave to receive and store the command, put the slave into command mode and then send the stored command to it. I bought the module and it was HC-06 ….. It doesn’t have Key pin but it have Wakeup pin on it. I can’t get it to work on AT mode !!!! HC-06 is the slave only module. It’s in AT mode only when it’s not connected to another device (like just after turning it on). I don’t think the wakeup pin does anything with HC-06 modules. I am trying to connect HC 05 module in master mode with Android phone : “AT+LINK=” command but is always shows “fail” indication. 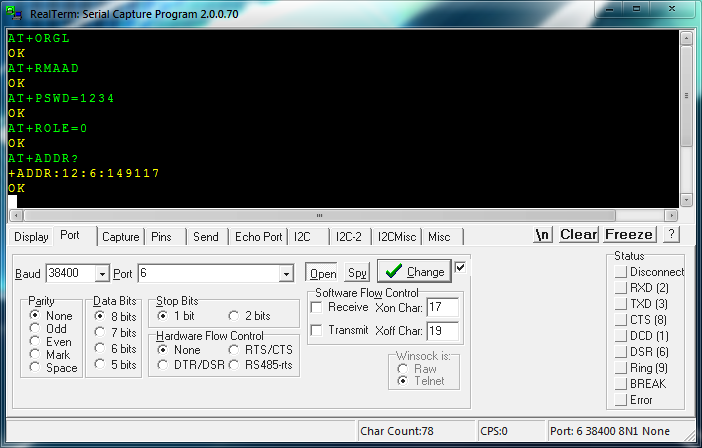 HC05 is been paired successfully, also AT+FSAD= is working successfully. please help on how to connect master mode of HC05 with android mobile. 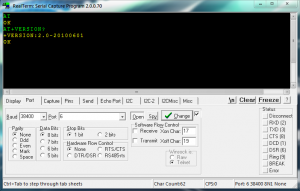 Your phone needs to be running an app that uses the serial port profile, like this one. I am trying to communicate between 2 AT89C51 MCUs using HC05 module. Currently struggling to get into AT command mode. Do I need to have MAX232 while connecting HC05 to PC using RS232 to serial USB converter. I am able to pair HC05 (while connected to AT89C51) using Blueterm app in Android. And it sends and receives data perfectly. But, I want to know is it possible to use one HC05 (connected to AT89C51) as master and other HC05(connected to other At89C51) as slave and these communicate. Also, can I configure AT commands by having program in AT89C51, i.e. 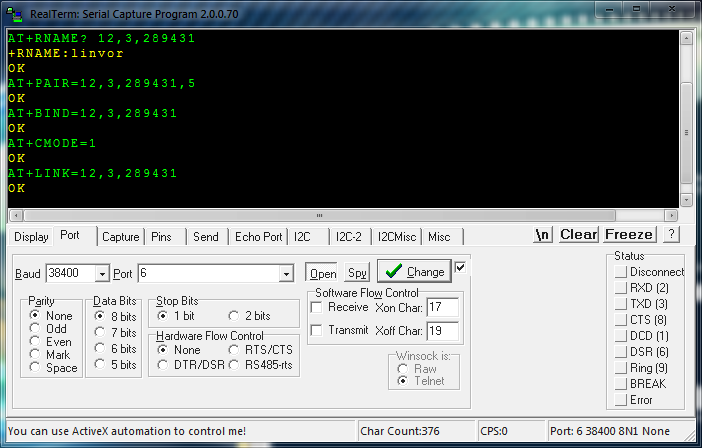 changing the frequency of oscillator in AT89C51(through program) to the one that matches AT command mode i.e., 38400. MAX232 is only for interfacing 5V/3.3V serial devices with real serial ports which use voltages around -12V to +12V. A serial USB converter doesn’t deal with voltages above 5V so no MAX232 is needed. HC05 modules can be configured as master or slave and can communicate with each other once connected. They can be configured by a microcontroller the same way as you would with typing the commands in with a serial terminal program; send “AT+RST” over UART and the module will reset. Normally you would know the baud rate beforehand and therefore already know what clock frequency and UART divider values you should use for the controller. In that case I have set Baud rate for AT89C51 as 38400. 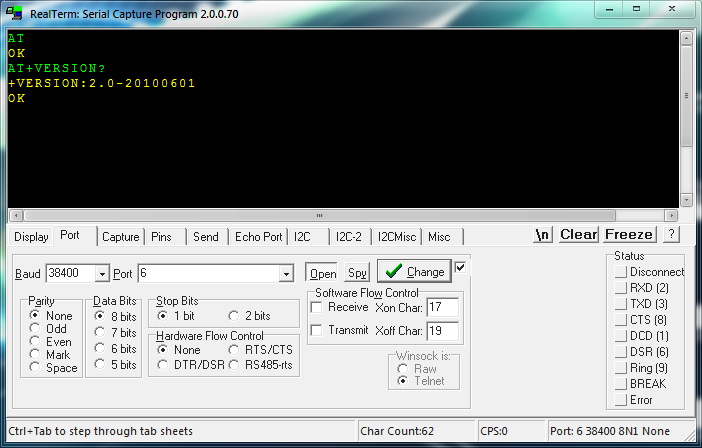 And HC05 is in AT command mode (Key pin is high – I get LED blink rate of 2 sec). Now should I try sending “AT\r\n” (ASCII values of \r and \n followed by “AT”) from microcontroller to the HC 05. I have connected LCD to check the response from HC05. I have been trying sending AT commands to HC05 (by connecting it to PC using USB-serial converter). In this case, there’s no MCU involved. But I observe nothing getting received in response of the AT command that I send through terminal on PC. 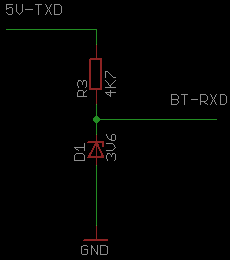 I observe constant 3.3 V on Tx pin (of USB to serial converter). But Rx remains always 0. But no response is seen from HC05 on terminal. The key pin should have 3.3V, not 5.5V and VCC should only have 5.5V if the module has a built-in 3.3V regulator (they usually do). Have you verified that the serial converter is actually sending data when nothing connected? And that it can also receive data from other devices that are known to work? What? MAX232 is on new series Bluetooth HC-06 and is here for voltage and logic to 3.3V. It does help. My two HC-05 talked each other successfully by following your steps. Just one question, after power-off and power-on again, the connection could not be recovered automatically, anything I missed ? Odd, the module should automatically save and load the settings. Does running AT+BIND? return the correct address and AT+CMODE return 0? thx for that tutorial. I’ve got an arduino nano rev.3.0 clone and tried the AT-Command-Mode with the hc-05-modul. The baudrate on the arduino is 9600 and from arduino to the hc-05 is 38400. But when I start and type AT i’ll get strange signes but not really an “OK”. When I test the Modul with an USB-TTL-(FTDI)-Adapter it works fine with Realterm. So there is an Problem with the Commication of the arduino and the hc-05-modul. The hc-06-bluetooth-modul works with the USB-TTL-Adapter and the arduino nano clone. I hope you can help me to get the hc-05-modul working on the arduino nano. >The baudrate on the arduino is 9600 and from arduino to the hc-05 is 38400. Are you using software serial for the 38400 baud part? Sounds like a baud rate mismatch somewhere. HI WAS YOUR BLUETOOTH HC-05 ABLE TO FIND YOUR ANDROID PHONE? thanx for that tutorial . i am a beginner with BT, SPP etc. i have hc-05 module. Is it possible to send/receive .txt file from android to microcontroller( which interface with hc-05 and sd card) or microcontroller to android.? is SPP support file transfer? I have an Android Phone, HC-05 gets paired with my phone (configured as Master) same as your steps. But when I have issued the command, AT+LINK=, It gives me error. Please recommend me with your valuable suggestions. @David, You also have the same issue. Please update me with solution. I have also installed the Sena BTerm APP. But still no Success. Is I need to do any setting in Sena BTerm APP? In the Sena BTerm App go to Menu > Bluetooth Configuration > configuration > Mode > Set to ‘3: Listen To Any’ > Apply then do the AT+LINK command. Once it connects, disconnect the KEY pin and you should be able to type stuff and it will appear at the other end. Could you please clarify the steps to set up the modules so that, after power off and back on, they will automatically ‘pair’ so that serial data can be exchanged. It seems to be: Configure one as master, other as slave. Matching PINs and Baud rates. What isn’t clear, do the names need to match? Thank you for a useful page. Hey, no the names do not need to match. Once the modules have successfully connected they should automatically reconnect next time they turn back on. Glad you found it useful 😀 It was mostly trial and error, seeing what happens when commands are entered and narrowing it down to just the commands needed to get things working. The modules are supposed to send UART serial data. Setting the RX to HIGH or LOW will not work, the other end will output a byte with the value 0 which is just a LOW pulse lasting no more than a few milliseconds depending on the baud rate. So you’ll still need something to process the incoming data, a microcontroller will give the most flexibility, but if you just want to turn something on and off then you could make a circuit with some logic gates or a 555 timer to trigger when it receives the LOW pulse from the module. with the HC-05 module (master), how can i get it to continually talk to several slaves. i have 4 sensors i want to be read by the master module. the data sheet leads me to believe the master can talk to several devices but i cannot seem to get this to work. Any help would be great. i have five HC-05 modules, 4 set to slave and 1 as master. You can only connect and communicate with 1 slave at a time. So you’ll need some program to send the appropriate commands to the master module telling it disconnect (AT+DISC) and connect to a different slave module. AT+INQ only searches for nearby Bluetooth devices. If it only returns OK then it couldn’t find any devices. Also once the Bluetooth module has connected it will no longer be searchable until it disconnects. I want to be able to communicate with the Wireless Buzzband BT-88. Its device name is “watchdog”, and its pairing code is “0000”. I’ve been playing around for a while, sending AT commands to the HC-05 from the Arduino nano. They seem to be being accepted, with OK’s etc. I really don’t know what I should be sending, as a set of AT commands and what to expect back from the device BT-88. Has anyone done this before? Any clues would be appreciated. Thanks . If you’ve sent the AT commands from the tutorial and they’ve all been accepted then everything should be ok. The BT-88 probably won’t send anything unless you tell it to, or unless you send it the correct commands (I can’t find much info about the BT-88). i have bought 2 HC05 module. they have a button on top and have an enable pin. the modules only enter the AT mode when the power is provided while pressing on to the button. but certain AT commands like AT+NAME? do not work and whenever i enter the command AT+INIT it comes out of the AT mode and does not show any message. what can be the problem? Hmm, could you link to where you brought the modules from? From what I can tell only HC-06 modules have an enable button. I managed to get this working but I did not use all the commands you gave. I used all commands up to setting the password. I just made my passwords identical slave/master and changed my baud rate to 38400 in my sketch and made a max of 1 device on connection, my baud was on 9600 in my sketch and i got gibberish sent to serial monitor. Funny but, i have to select 9600 baud in serial monitor when using my HC-05 in the serial converter? I really needed this for my wireless weather station transmission to an indoor LCD display. Have not tried to use as yet on my weather station but it works to send data from arduino to my laptop in serial monitor with the HC-05 plugged in the serial converter to program lillypad clones. What else do i need to do to read the data on another arduino? Do i just use if serial.available > 0 than serial.read? If you’re just getting gibbering then the baud is probably set wrong somewhere. To read the serial data on another Arduino you would use the same code as you would when reading from a PC, so yeah serial.available .read stuff is correct. However, the hardware serial (pin 0 and 1) is also used by the serial-USB chip for uploading sketches and may interfere with the bluetooth module. You could try using software serial instead if it’s a problem. Receiving weird signs most likely means you’ve set the wrong baud rate somewhere. Does it only response with FAIL during the INQ command? If you can still get it to connect then it’s probably nothing to worry about. First of all thumbs up lad, its a really good tutorial. I have one question, I’m not using the USB to serial converter but sending direct AT commands from my microcontroller (UART). Now in order to send an AT command such as AT+NAME= I have to write \r\n at the end of each command in order to show that that’s the end of my command. The response from the BT, such as OK, Address and stuff like that, I’m trying to paste it all on an LCD. I’ve did an array and stuff like that, now when the BT sends the response does it use \r\n at the end, as I need to know when the transmitter of the BT has stopped transmitting. Yeah, the modules respond with \r\n for a new line. Cheers man, another question. If I pair the slave and the master as instructed above, they will not be able to pair with any other BT devices? even if the master is not in range of the slave? I understand that if the master is in range of the slave and is paired no other BT can connect to it, but what basically i’m asking is, if the master is not in range of the slave and someone else tries to connect to the slave, will it be possible.. or since that address and stuff like that have been set its not possible? Hmm, it might be possible. I think the master module can store multiple pair addresses. Run the AT+PAIR command to pair with different devices and keep AT+CMODE set to 1, that might make it connect to whatever device it can find that’s in the paired list. The command AT+ADCN? will show the number of paired devices. Just one question can I connect and pair 1 HC05 master with two to 4 slaves (SPP) Bluetooth in order to receive some readings? If it is possible and reliable any suggestions how to do it? No, these modules can only connect to one device at a time. You need to manually tell it to disconnect (AT+DISC) and connect when you want to talk to a different module. 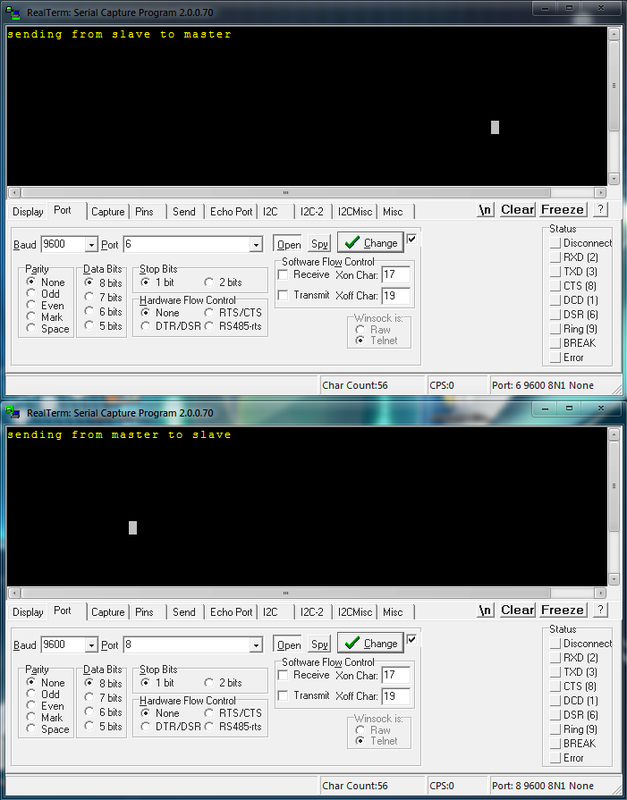 Try different baud rates on the serial monitor, there’s a list of possible bauds in the configuring slave section. Press and hold small button above EN pin. Power on and keep pressing small button. Small LED should start to blink slowly about once every 2 seconds. is that possible when 1 master bluetooth send a data to several slave bluetooth simultaniously? several slave bluetooth (i.e=5 slave bluetooth) receive data ‘abcdefg’ at simultaniously (at the same time) not alternately. Hey, no, these modules only support 1-to-1 communication. 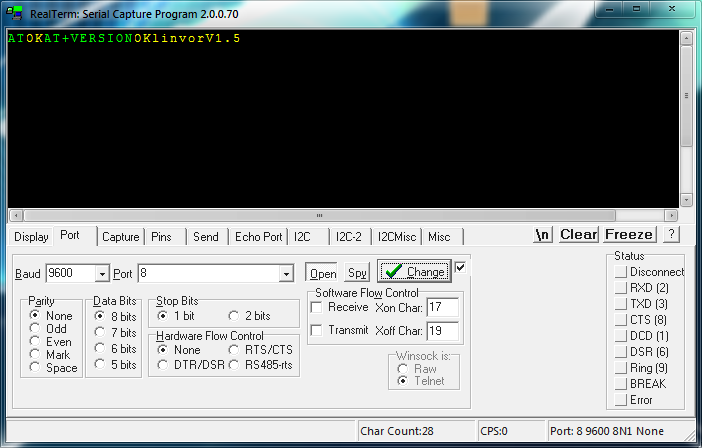 i am trying to send AT commands to my bluetooth using UART. whenever i am sending any command like AT+ROLE1, i am getting only ok response from my bluetooth. i think it is because whenever i send some command to bluetooth it is being sent byte wise byte and by the time by bluetooth is getting AT it is not waiting for the remaining part and it is responding only for AT as ok. kindly help me to solve this problm..
That would be what it should do. Most of the commands only respond with “OK”. Hi, I am very new to this so please excuse me for the dumb question. I have an HM-10, I connected it to a 3.3v battery and I can see it on my phone. Now, what I want to be able to do is very simple: I want to attach a button on the HM-10 and when its pressed, to be able to detect it on my phone app. Maybe one way to do this would be to configure the HM-10 as a “beacon” transmitting an specific guid and the button could simply connect the battery when pressed. The problem with this is that if it take too long to the HM-10 trasmit the data (does it? ), the user would have to hold the button pressed so it is not very elegant. I do not need to send a lot of data, just a “ping” from the HM-10 to my app… is this possible without extra components like an arduino or such? Hey Leo, I think one way would be to connect a button between the RX pin of the bluetooth module and ground, and maybe a 10k resistor from the RX pin to VCC. Pressing the button might make the module send some random data, however if you need some kind of device ID then you’ll need a microcontroller. A small ATtiny10 will do the job of sending some valid serial data when a button is pressed, though I think the smallest Arduino compatible chip is an ATtiny85. Hi i have connected two HC05 bluetooth module and set as master and slave. Now i want to send data from master to slave so please which should i use to send the data read from sensor on master to slave serial monitor. Once the 2 bluetooth modules have connected you can send data from either module, it doesn’t matter which one is the master or slave.